I will be doing a few part series focusing on a project that I am currently working on. Previously I had written an article on how to recognize a big bear when it's staring you in the face. I recently read an article on How to Get Rich By Predicting the Future over at Financial Samurai. For some time now I have been planning to give financial advice in a more specific manner as in give people very concise input or suggestions. I don't like to blow smoke up peoples' asses so it would be preferable to write about things I have actually done instead of copying things I read on the internet and regurgitating them. These next few literary strokes of genius from me will be focusing on an investment I am making, and all the reasons I chose to make it. 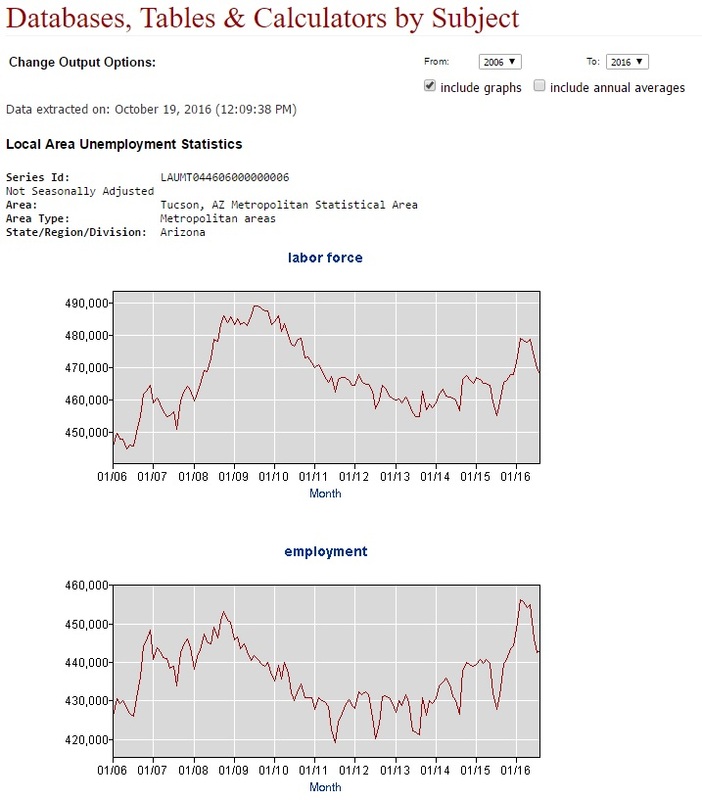 Lets take a trip to the Bureau of Labor Statistics (BLS) website. I have always found that this website gives credence to the our instincts when real estate investing. It can be used for getting fairly accurate economic data on cities. Once there, you will look for the Tucson, AZ economy at a glance page. This page describes pretty much what the title implies, vastly simplified metrics relating to the labor force in Tucson in number form. I immediately will direct you to the tiny block that looks like a graph, because the numerical data would take a very long time to sort through and for our purpose it would not serve a purpose. Labor force is defined as the sum of employed and unemployed persons. The labor force is not as large as it's peak in 2009. Employment is higher now than in it's peak of late 2008. Employment is also relatively seasonal which you can see by the dips every year in the mid-year range. The quantity and overall rate of unemployed people is not as low as it was in mid 2007. However it has vastly improved from the high in 2010 and has been steadily declining since that time. Tucson AZ has not reached its peak in terms of employment rate. Tuscon AZ has not reached its lowest unemployment rate level since 2008. Tucson will maintain its highest level of labor force as a yearly average that takes into account the seasonal work for at least 2 years. And with that, I leave you to your thoughts.